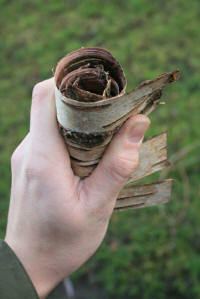 Most Bushcrafter's know that Birch bark is fantastic for fire lighting because of all the oil concealed within it. 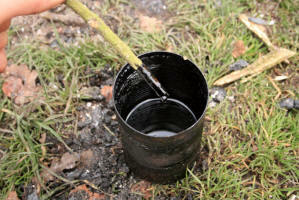 This tutorial guides you through the process of extracting that tar from the bark. 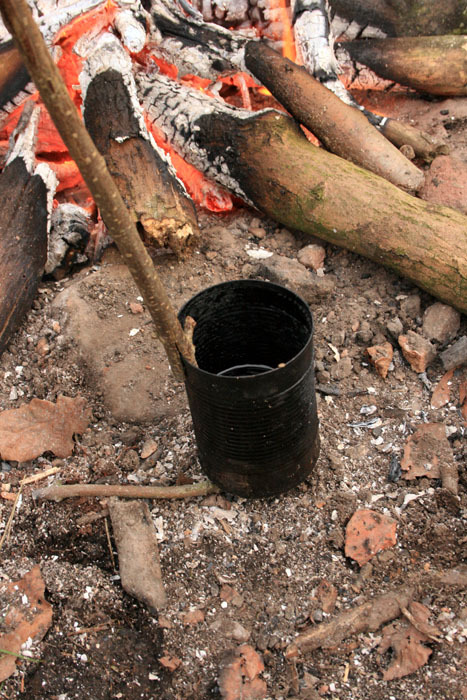 The tar is extremely useful for all kinds of bushcraft jobs, like when you want to secure arrow heads to shafts for example. 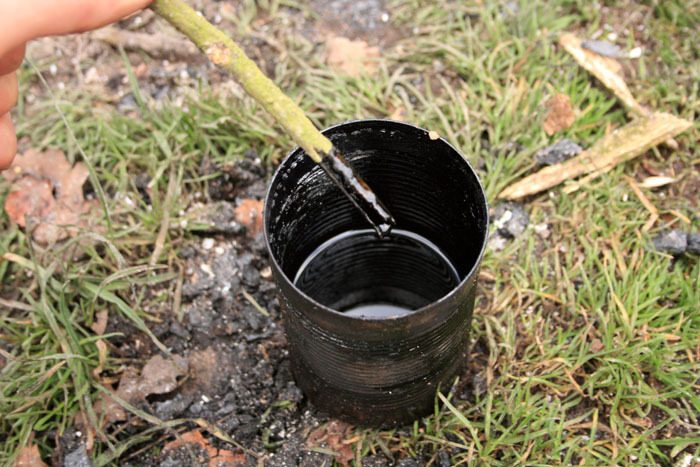 The uses of birch tar are endless and it's an amazing material! To start off you are going to need some kind metal container, a large sweet tin, biscuit tin or empty paint can is ideal. Make a whole in the bottom of the tin in the centre. Collect your bark from dead birch trees, there is no need to go stripping fresh bark! You can take advantage of that bark that is too tatty to use for crafts. I got all the bark i needed from just one small fallen tree. 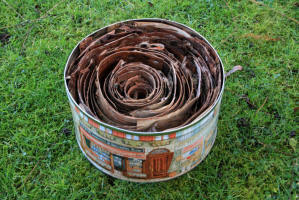 Tear the bark into strips as high as the height of the tin, then begin rolling them up into a bundle. Note: Dead birch trees are a common home to nesting woodpeckers, mice and other creatures, do not destroy their habitat! You will notice that once the bark is rolled up tightly it wants to spring back out again, so every so often i tie a piece of string around the bark to make life easier. 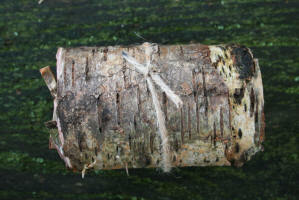 Keep rolling on pieces of bark onto your bundle until it is as wide as the tin. 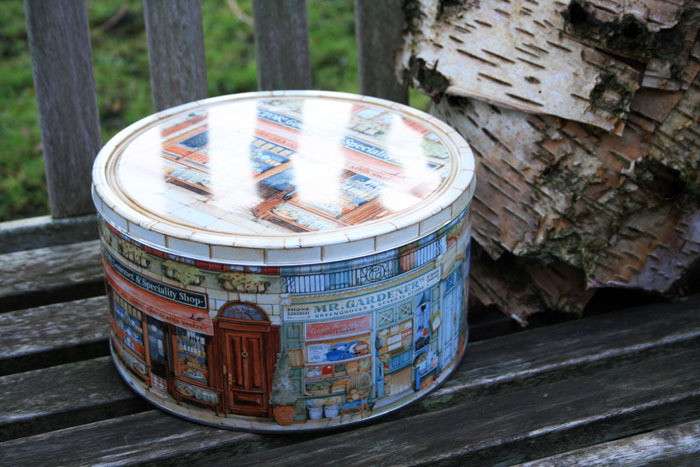 When you put the bark into the tin you can always shove more bark into the areas that are not tightly packed. 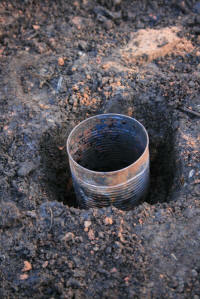 If the bark was not rolled up and packed into the tin in this way the tar would not escape from the bark as easily. Notice that the bark is the same way up in the tin as on a tree. Now its time to prepare to extract! At your fire site dig a small whole in the ground and insert another small metal container, i find a baked bean can is best, then fill in the gaps around the can with earth. The whole in the large tin needs to go directly above this can. Make sure the rim of the baked bean can and the base of the tin are flush together. You can move more earth up and around the sides of your large tin to prevent it from moving out of alignment. 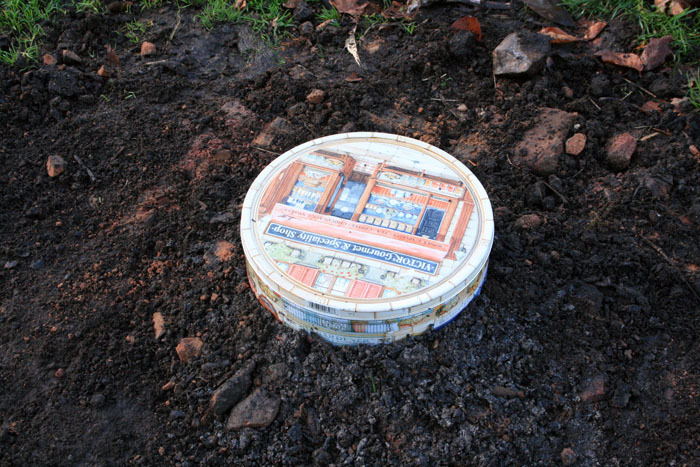 Now light a fire on top of the tin. 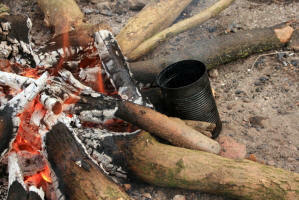 When the bark inside the tin is heated to extreme temperatures it releases the tar as a thick vapour. This vapour will go down through the whole and distil in the baked bean can underneath. The process takes a few hours for all of the tar to extract properly. For this time you should keep the fire well maintained. 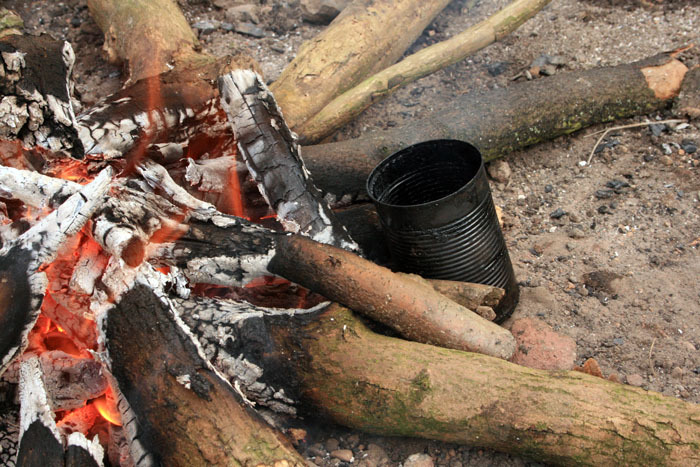 After a few hours have passed and the fire has nearly burnt out, all that will be left in the tin will be the charred bark. 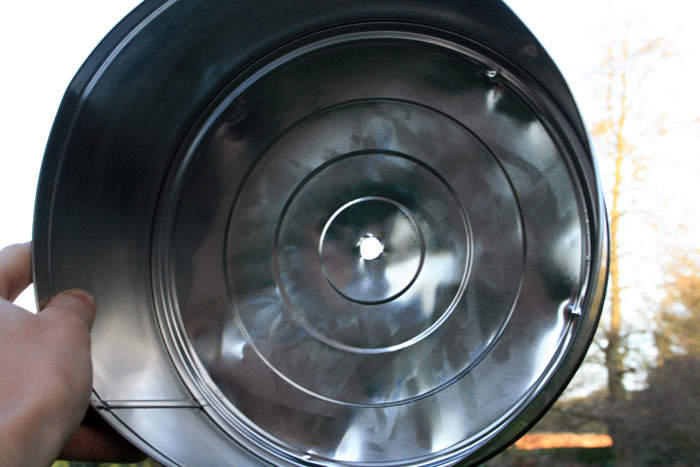 Lift the tin off to reveal the tar in the baked bean can. 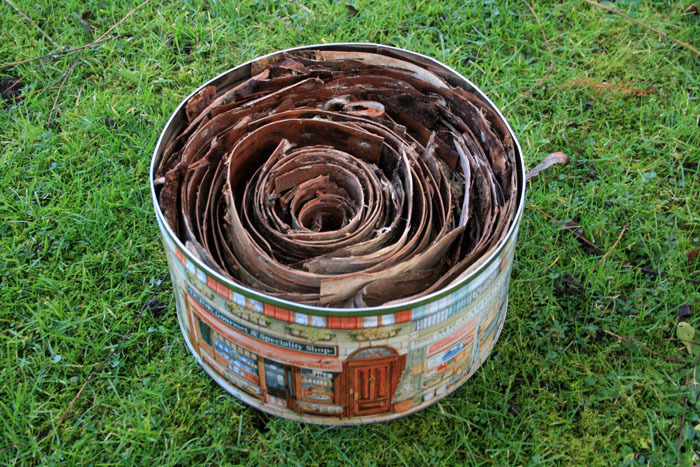 My tin full of bark typically collects just a little less than half a can of tar. Note: Do not remove the tin from its position while the fire is still burning around it as the vapours are very flammable and catch alight easily. Obviously you can't touch the can whilst it is that hot so i find a stick with a small split in the end is a very handy tool. Push the stick onto the rim of the can so that rim is held in the middle of the split. Carry on reducing the tar down. Dip the end of a small stick into the tar every so often and let it cool, you can test how tacky the tar is with your fingers. 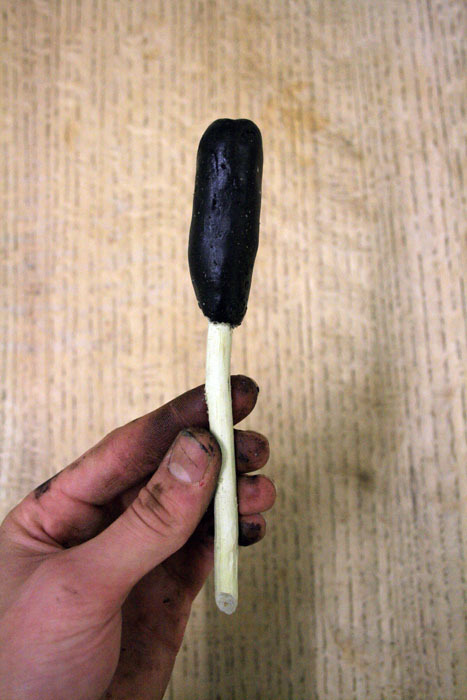 It might take another few hours until the tar begins to set on the end of the dip stick. 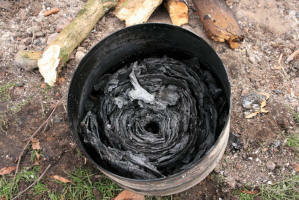 When the tar does start to set take the can away from the fire and let it cool for a while. You can now tell for sure whether it sets hard enough. 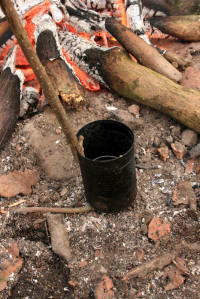 You can scrape out the tar from the can while it is still warm and gooey, and then mould it onto the end of a stick. 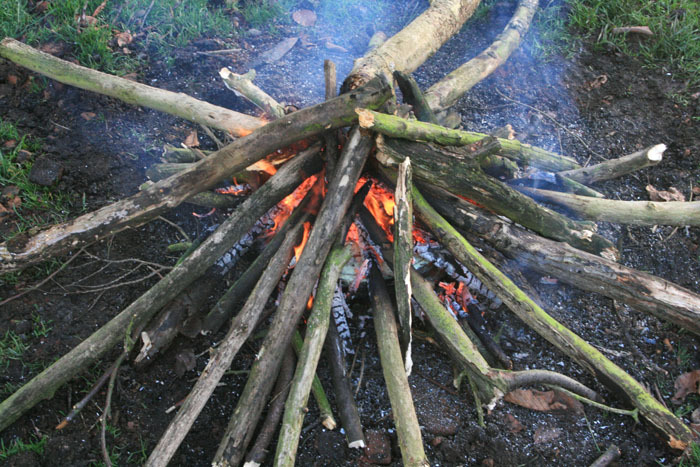 When you need to use some of the tar simply hold your tar loaded stick over a flame for a second or two until it goes gooey again and then apply it quickly to the surfaces you want to stick. It sets very fast so you've got to be quick.